Cha J., Roomi M.W., Ivanov V., Kalinovsky T., Niedzwiecki A., Rath M.
Summary. Aim: Our main objective was to determine the effect of ascorbate supplementation in mice unable to synthesize ascorbic acid (gulo KO) when challenged with murine B16FO cancer cells. Methods: Gulo KO female mice 36–40 weeks of age were deprived of or maintained on ascorbate in food and water for 4 weeks prior to subcutaneous injection of 2.5×106 B16FO murine melanoma cells in the right flank of mice. A control group of wild type mice were also injected with the melanoma cells and maintained on a regular murine diet. Mice were continued on their respective diets for another 2 weeks after injection. The mice were then sacrificed, blood was drawn and their tumors were measured, excised and processed for histology. Results: Mean weight of animals decreased significantly (30%, p < 0.0001) in the ascorbate-restricted group but increased slightly, but insignificantly, in the ascorbate-supplemented group. The mean tumor weight in ascorbate supplemented mice was significantly reduced (by 64%, p = 0.004) compared to tumor weight in ascorbate-deprived gulo mice. The mean tumor weight of wild type mice did not differ significantly from the ascorbate-supplemented mice. Gulo KO mice supplemented with ascorbate developed smaller tumors with more collagen encapsulation and fibrous capsule interdigitation, while gulo KO mice deprived of ascorbate hosted large tumors with poorly defined borders, showing more necrosis and mitosis. Ascorbate supplementation of gulo KO mice resulted in profoundly decreased serum inflammatory cytokine IL-6 (90% decrease, p = 0.04) and IL-1β (62% decrease) compared to the levels in gulo KO mice deprived of ascorbate. Conclusion: Ascorbate supplementation modulated tumor growth and inflammatory cytokine secretion as well as enhanced encapsulation of tumors in scorbutic mice. Abbreviation used: Gulo KO mice – gulonolactone oxidase knockout mice. Melanoma causes the majority of skin cancer-related deaths, due to metastasis to other areas of the body, such as lymph nodes, lungs, liver, brain or bone. Though often curable in its early stages, metastatic malignant melanoma is an extremely aggressive cancer with no current viable treatment. Thus, any successful treatment for melanoma has to target metastasis. Invasion of host tissues by cancer cells requires alteration of cancer cell adhesion, cell migration and proteolytic degradation of the extracellular matrix (ECM) . Stromal resistance is dependent upon the ability of the host to encapsulate tumor cells in a dense barrier of fibrous tissue. Rath and Pauling postulated that essential nutrients needed for optimum synthesis and structure of collagen, such as vitamin C and lysine are critical components in natural control of spread and invasion of cancer cells in the body . Ascorbic acid, needed for synthesis and hydroxylation of collagen and optimal stability of the extracellular matrix (ECM), is internally produced by most animals but not by humans . Humans must obtain ascorbate by diet and cancer patients have been shown to have very low reserves of vitamin C [3, 4]. Dr. McCormick was the first to note that the generalized stromal changes of scurvy were identical with the local stromal changes observed in cancer in the immediate vicinity of invading neoplastic cells . Scurvy, which results from severe dietary lack of ascorbate, is characterized by generalized tissue disintegration, including the intercellular ground substance and the collagen bundles, and lysis of the interepithelial and interendothelial cements. This condition leads to ulceration, secondary bacterial infection, vascular disorganization (edema and interstitial hemorrhage) and generalized cellular proliferation, with specialized cells through the tissue reverting to a primitive form. Patients with advanced cancer exhibit symptoms virtually identical with those shown by humans with advanced scurvy: anemia, cachexia, extreme lassitude, hemorrhages, ulceration, susceptibility to infections and abnormally low tissue, plasma and leukocyte ascorbate levels, and terminal adrenal failure. Suggestions have been proposed to supplement cancer patients with ascorbate to reverse their scorbutic symptoms and treat the cancer, as well as improve the patients’ quality of life [6, 7]. Our main objective was to determine the effect of ascorbate supplementation in mice unable to synthesize ascorbic acid, gulonolactone oxidase (gulo) knockout (KO) mice, on the development of tumors when challenged with murine B16FO cancer cells. Animals. Female Balb/C wild type mice and mice heterozygous for the sfx mutation, a deletion in the L-gulono-gamma lactone oxidase gene (gulo) were obtained from The Jackson Laboratory (Bar Harbor, ME). The gulo mice were bred to develop a homozygous gulo (-/-) colony and were maintained on Vitamin C fortified food and water. Genotyping of litters was performed through Transnetyx (Cordova, TN) and female gulo (-/-) mice were selected from the homozygous colony for the study. Wild type and gulo (-/-) mice selected for the study were approximately 36–40 weeks of age. They were acclimated for a week before treatments, housed in standard separator cages with bedding on a 24-hour light/dark schedule. All animals were cared for in accordance with institutional guidelines for the care and use of experimental animals. Diet. Gulo (-/-) mice were divided into two groups: group 1 (n = 11) and 2 (n = 11) and wild type mice (n = 6) were allocated to group 3. Prior to injection with melanoma cells, the groups of mice were maintained for 4 weeks on the following diets. Group 1 (vitamin C deprived gulo (-/-) mice) and Group 3 (wild type mice) were maintained on a regular diet (Laboratory Rodent Diet 5001 from Purina Mills, LLC/Test Diet) and distilled water. Group 2 (vitamin C-supplemented gulo (-/-) mice) were provided the regular diet supplemented with 500 ppm L-ascorbyl-2-polyphosphate and distilled water with 150 mg/L ascorbic acid, 0.01 mM EDTA. The ascorbate-supplemented nutrient mix diet was milled and pressed by Purina Mills, LLC. Experimental design. After mice had been on their respective diets for 4 weeks, 2.5 × 106 murine melanoma B16FO cells in 0.2 ml PBS and 0.1 ml Matrigel (BD Bioscience, Bedford, MA) were injected subcutaneously into the shaven right flank of each mouse. Mice were continued on their respective diets for another 2 weeks. Body weight measurements (in triplicates) of all mice were taken every 3 to 4 days beginning 1 week before harvest. The mice were then sacrificed, blood was drawn and their tumors were measured, excised, weighed, photographed and processed for histology. All procedures were conducted under protocols approved by the Internal Animal Care and Use Committee (IACUC). Serum analysis. Serum was processed from whole blood and stored at -80°C until analyzed. Cytokine analyses, including interleukin (IL)-6, IL-1β, granulocyte macrophage colony-stimulating factor (GM-CSF), tumor necrosis factor (TNFα), IL-2 and vascular endothelial growth factor (VEGF), were run in duplicates by Procarta® Cytokine Assay Service using Procarta® Cytokine kit mouse 8-plex at Affymetrix (Santa Clara, CA). Serum ascorbate analysis was performed using the Ferric Reducing Ascorbate (FRASC) Assay Kit form Biovision (Mountain View, CA). Histology. Tumors were placed in a formalin cassette and sent to IDEXX for analysis. Formalin fixed samples of tumors, skin, kidneys and livers were trimmed, processed, blocked, sectioned and stained with H&E and EVG stains, and evaluated microscopically by IDEXX Pathology. Statistical analysis. The results were expressed as means ± SD, as indicated in the results, for the groups. Data was analyzed by independent sample “t” test using MedCalc Software (Markakerke, Belgium). Effect of dietary ascorbate on tumor growth in mice. The mean tumor weight in ascorbate supplemented mice (0.114 ± 0.096 g) was significantly reduced (by 64%, p = 0.004) compared to tumor weight in ascorbate-deprived gulo KO mice (0.317 ± 0.155 g), as shown in Fig. 1. The mean tumor weight of wild type mice (0.109 ± 0.064 g) was not statistically significant from the ascorbate-supplemented mice. Among the gulo (-/-) mice deprived of ascorbate two mice developed metastasis and one a premature death, while neither the wild type nor ascorbate supplemented gulo (-/-) mice developed metastases. 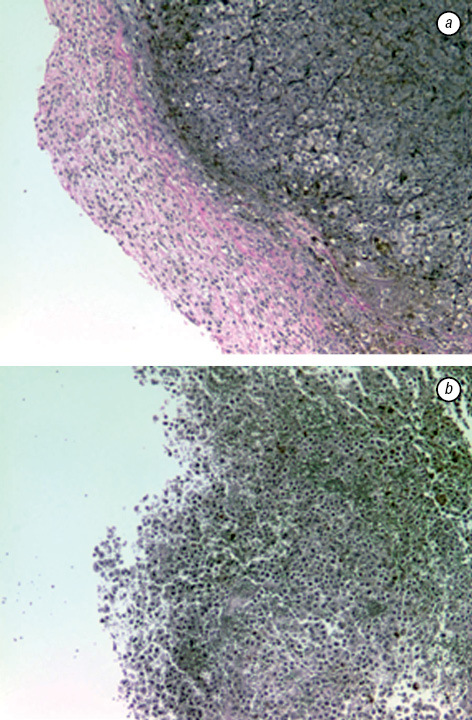 Gross tumor photographs of representative tumors from the gulo KO groups is shown in Fig. 2. (Note: Among the supplemented group, 3 data points were removed due to 2 gravidities and 1 anesthesia death before tumor inoculation). Effect of vitamin C supplementation on tumor histology. Gulo KO mice supplemented with ascorbate hosted smaller tumors with more collagen encapsulation and fibrous capsule interdigitation (Fig. 3, a). The smallest tumor had an unusually thick fibrous capsule of collagen and a few elastic fibers. In contrast, gulo KO mice deprived of ascorbate hosted large tumors with poorly defined borders, showing more necrosis and mitosis (Fig. 3, b). These conditions coincided with severe metastasis from the primary tumor to the colon and/or spleen in a couple of the ascorbate deprived gulo KO mice (a more dynamic tumor characterized by cell death and turnover and poorly defined borders correlates with metastasis). Wild type mice challenged with melanoma cells formed well-defined tumors, encapsulated with a fibrous capsule of collagen. An inflammatory infiltrate was observed in some wild type tumors. Effect of dietary ascorbate on weight of mice. The mean weight of mice in each group did not significantly differ at onset or at 7 days post injection. 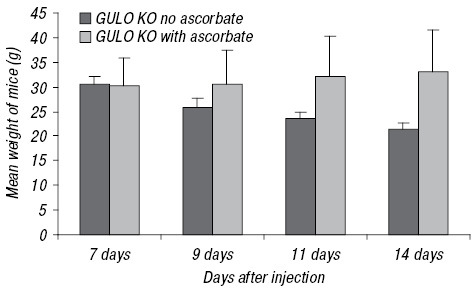 However, the mean weight of ascorbate restricted gulo (-/-) mice significantly decreased with time, showing a 30% (p < 0.0001) decrease in weight at 14 days post injection compared to the mean weight at 7 days post injection. Furthermore, the weight of ascorbate-supplemented gulo (-/-) mice continued to increase slightly over time, but did not reach statistical significance. 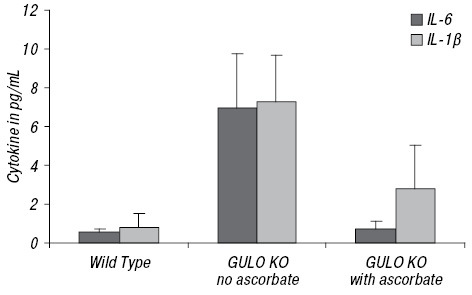 However, the final mean weight of gulo (-/-) ascorbate-deprived mice was 36% lower than the mean final weight of gulo (-/-) mice supplemented with ascorbate, as shown in Fig. 4. Effect of ascorbate supplementation on cytokines. 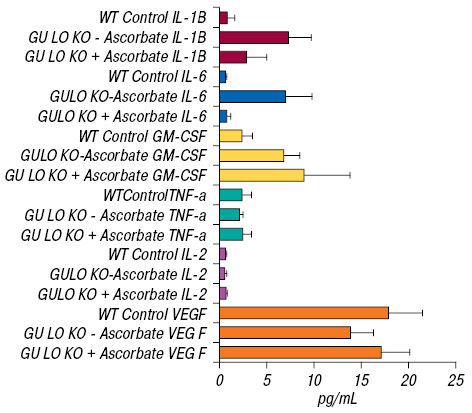 Serum inflammatory cytokines IL-6 and IL-1β were substantially higher in gulo KO mice deprived of ascorbate than in gulo KO mice supplemented with ascorbate, as shown in Fig. 6. For the gulo KO scorbutic mouse group, the mean IL-6 level per mouse was 6.97 ± 7.85 pg/mL compared to 0.715 ± 1.08 in the ascorbate supplemented gulo KO group (90% decrease, p = 0.04). In regard to IL-1β, ascorbate supplementation resulted in a 62% decrease from the level in the restricted gulo KO group, but the difference did not reach statistical significance. Mean IL-1β levels per mouse were 2.82 ± 5.68 and 7.25 ± 6.74 pg/mL in the ascorbate supplemented and deprived gulo KO mice, respectively. The mean IL-1β level in wild type mice was significantly lower (11%, p = 0.04) than in the ascorbate deprived gulo KO mice but did not significantly differ from the mean level in ascorbate supplemented gulo KO mice. Mean GM-CSF, TNFα, IL-2 and VEGF levels did not significantly differ between ascorbate supplemented and deprived gulo KO mice. See Table and Fig. 5 for cytokine levels in groups. Notes: IL-1β — interleukin-1β, IL-6 — interleukin-6, GM-CSF — granulocyte macrophage colony-stimulating factor, TNF-α — tumor necrosis factor-α, IL-2 — interleukin-2, VEGF — vascular endothelial growth factor. Effect of ascorbate supplementation on serum ascorbate levels in gulo KO mice. 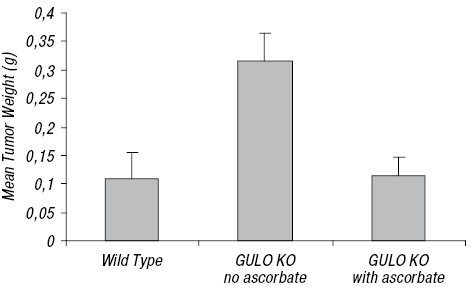 As expected, ascorbate-supplemented gulo KO mice were found to have profoundly higher ascorbate levels than did the unsupplemented gulo KO mice (Fig. 7). Mean serum ascorbate level in ascorbate restricted mice (7.72 ± 15.5 µM) was 9% (p < 0.001) of the mean ascorbate level in supplemented mice (85.8 ± 22.6 µM). Wild type mice also showed significantly higher ascorbate levels than the restricted mice (68.6 ± 17.1 µM). The mean ascorbate level in wild type mice was found to be 80% of that in ascorbate supplemented mice, but the difference did not reach statistical significance. Numerous studies report that cancer patients exhibit abnormally low plasma ascorbate levels secondary to the disease and/or treatment [3, 4, 8, 9]. Studies have demonstrated a correlation between deficient plasma ascorbate levels in cancer patients and decreased survival, as well as increased expression of inflammatory markers . A correlation between tumor aggressiveness and low ascorbate content has also been reported . Ascorbate has been implicated in host resistance to neoplasia, at both the stromal and systemic levels. Invasiveness, characteristic of melanoma and other metastatic cancers, depends upon the structural integrity of the ground substance matrix as a barrier to invasiveness. Degradation of adjacent matrix in the vicinity of invading neoplastic cells is dependent upon continual release of lysosomal glycosidases (hyaluronidases) , proteases and collagenases from the invading cells [1, 10]. In our study, ascorbate supplementation of gulo KO mice resulted in significant reduction (by 64%, p = 0.004) in the mean tumor weight compared to that in ascorbate-deprived gulo KO mice, In addition, gulo KO mice supplemented with ascorbate hosted smaller tumors with enhanced collagen encapsulation and fibrous capsule interdigitation. In contrast, gulo KO mice deprived of ascorbate hosted large tumors with poorly defined borders, showing more necrosis and mitosis. Tumors in scorbutic mice with systemic metastasis showed multi-focal collagen capsule breaks or absent collagen capsules. 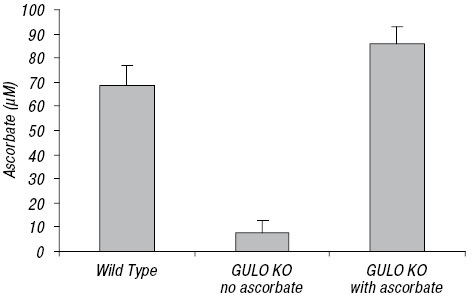 Tumors in ascorbate supplemented gulo KO mice had much thicker collagen capsules and were of similar size to those in wild type vitamin C generating mice. Interestingly, Moriarty et al. reported that a shift of ascorbate occurs from reserves to the tumor stroma, resulting in ascorbate levels in human tumors to be higher than that in the surrounding tissues, resulting in significant depletion of circulating reserves. The ascorbate is reported to concentrate at the periphery of the tumor, against the actively growing invasive margin . Although most animals can synthesize ascorbic acid, humans cannot and are totally dependent upon dietary intake. Ascorbic acid is known to be required for the structural integrity of the intercellular matrix and closely related to glucoronic acid, an essential building block of the matrix structure. Increasing amounts of ascorbic acid are needed for protective encapsulation of tumors. Stromal resistance is dependent upon the host’s ability to encapsulate the neoplastic cells by forming a practically impenetrable barrier of dense fibrous tissue . Highly anaplastic invasive tumors are associated with a scanty, poorly defined collagenous barrier. Collagenous barriers are found to be more defined in tumors of moderate rapidity of growth and very abundant in slow-growing “contained” atrophic scirrhous tumors . Our studies have shown that a combination of ascorbate with other micronutrients have profound anti-cancer effects mediated through increased stability of connective tissue, including suppression of metastasis, tumor growth, angiogenesis in more than 40 types of human tumor cells . Cancer patients exhibit chronic low-grade inflammation that causes a variety of pathologies, such as cachexia and poor postsurgical outcome [14, 15]. Levels of serum cytokines, such as IL-6, IL-1β, IL-1α, IL-8, IL-12p40 IL-13, GM-CSF, monocyte chemoattractant protein- (MCP-1), macrophage inflammatory protein (MP)-1α, MP-1β, IFNα, tumor necrosis factor (TNF)-α, epidermal growth factor, VEGF and TNF receptor II are reported to be significantly higher in patients with resected high-risk melanoma than in healthy controls . These factors promote tumor cell growth and stimulate endothelial cell proliferation, migration and angiogenesis, which lead to melanoma growth and metastasis . Clinical studies have shown significantly increased levels of serum IL-6 in malignant metastatic melanoma patients and have been found to be correlated to the tumor burden in these patients [18–20]. Since IL-6 promotes melanoma progression and resistance to chemotherapy, new approaches to treatment have focused on targeting IL-6. In our study, ascorbate supplementation of scorbutic mice, showed significantly reduced levels of IL-6 than the ascorbate deprived scorbutic mice. Of interest, weight loss occurred in the gulo (-/-) mice deprived of ascorbate but not in those supplemented with ascorbate. The weight loss observed in cancer patients, secondary to the inflammation-associated cachexia, mirrors the weight loss observed in the scorbutic mice with high IL-6 and IL-1β levels. The comparative ascorbate serum levels in the respective groups of mice support the claim that the beneficial effects observed in the ascorbate-supplemented mice were due to significantly increased serum ascorbate levels. Among the melanoma bearing mice in this study, ascorbate-supplemented gulo KO mice were found to have profoundly higher (an increase of 1111%) ascorbate levels than did the restricted gulo KO mice and slightly higher (125%) levels than the ascorbate producing wild type mice. In conclusion, ascorbate supplementation resulted in decreased tumor growth and enhanced encapsulation of tumors elicited by melanoma challenge in scorbutic mice. Tumor encapsulation is critical in curbing invasion and metastasis of malignant cells. In addition, ascorbate supplementation modulated inflammatory cytokine secretion. Special thanks to Earl Rainey for animal colony maintenance. 1. Fidler IJ. Molecular biology of cancer: Invasion and metastasis. In: Cancer: Principles and practice of oncology (ed 5). De Vita VT, Hellman S, Rosenberg SA, eds. Philadelphia, PA, Lippincott-Raven, 1997, 135–152. 2. Rath M, Pauling L. Plasmin-induced proteolysis and the role of apoprotein(a), lysine and synthetic analogs. Orthomolecular Medicine 1992; 7: 17–23. 3. Nunez C, Ortiz de Apodaca Y, Ruiz AL. Ascorbic acid in the plasma and blood cells of women with breast cancer. The effect of consumption of food with an elevated content of this vitamin. Nutr Hosp 1995; 10: 368–72. 4. Anthony HM, Schorah CJ. Severe hypovitaminosis C in lung-cancer patients: the utilization of vitamin C in surgical repair and lymphocyte-related host resistance. Br J Cancer 1982; 46: 354–67. 5. McCormick WJ. Cancer: a collagen disease, secondary to nutritional deficiency? Arch Pediatr 1959; 78: 166–171. 6. Cameron E, Pauling L, Leibovitz B. Ascorbic acid and cancer: a review. Cancer Res 1979; 39: 663–81. 7. Ichim TE, Minev B, Braciak T, et al. Intravenous ascorbic acid to prevent and treat cancer-associated sepsis? J Translational Med 2011; 9: 25–38. 8. Mayland CR, Bennett MI, Allan K. Vitamin C deficiency in cancer patients. Palliat Med 2005; 19: 17–20. 9. Kuiper C, Molenaar IG, Dachs GU, et al. Low ascorbate levels are associated with increased hypoxia-inducible factor-1 activity and an aggressive tumor phenotype in endometrial cancer. Cancer Res 2010; 70: 5749–58. 10. Stetler-Stevenson WG, Hewitt R, Corcoran M. Matrix metalloproteinases and tumor invasion from correlation and causality to the clinic. Semin Cancer Biol 1996; 7: 174–54. 11. Moriarty MJ, Mulgrew S, Malone JR, et al. Results and analysis of tumour levels of ascorbic acid. Ir J Med Sci 1977; 146: 74–78. 12. Chinoy NJ. Histochemical studies on ascorbic acid in human cancerous tissue and its significance. J Anim Morphol Physiol 1972; 19: 238–40. 13. Niedzwiecki A, Roomi MW, Kalinovsky T, et al. Micronutrient synergy — a new tool in effective control of metastasis and other key mechanisms of cancer. Cancer Metastasis Rev 2010; 29: 529–43. 14. Argiles JM, Busquets S, Toledo M, et al. The role of cytokines in cancer cachexia. Curr Opin Support Palliat Care 2009; 3: 263–8. 15. Deans C, Wigmore SJ. Systemic inflammation, cachexia and prognosis in patients with cancer. Curr Opin Clin Nutr Metab Care 2005; 8: 265–9. 16. Yurkovetsy ZR, Kirkwood JM, Edington HD, et al. Multiplex analysis of serum cytokines in melanoma patients treated with interferon-α2b. Clin Cancer Res 2007; 13: 2422–8. 17. Lazar-Molnar E, Hegyesi H, Toth S, et al. Autocrine and paracrine regulation by cytokines and growth factors in melanoma. Cytokine 2000; 12: 547–54. 18. Mouawad R, Benhammouda A, Rixe O, et al. Endo­genous interleukin 6 levels in patients with metastatic malignant melanoma: correlation with tumor burden. Clin Cancer Res 1996; 2: 1405–9. 19. Mouawad R, Rixe O, Meric JB, et al. Serum interleukin 6 concentration as predictive factor of time to progression in metastatic malignant melanoma patients treated by biochemotherapy: a retrospective study. Cytokines Cell Mol Ther 2002; 7: 151–6. 20. Tawara K, Oxford JT, Jorcyk CL. Clinical significance of interleukin (IL)-6 in cancer metastasis to bone: potential of anti-IL-6 therapies. Cancer Management Research 2011; 3: 177–89.